The Mesozoic Era (pronunciation: /ˌmɛsəˈzoʊɪk, ˌmiː-, -soʊ-/ or /ˌmɛzəˈzoʊɪk, ˌmiː-, -soʊ-/) is an interval of geological time from about 252 to 66 million years ago. It is also called the Age of Reptiles, a phrase introduced by the 19th century paleontologist Gideon Mantell who viewed it as dominated by diapsids such as Iguanodon, Megalosaurus, Plesiosaurus and Pterodactylus. This Era is also called from a paleobotanist view the Age of Conifers. Mesozoic means "middle life", deriving from the Greek prefix meso-/μεσο- for "between" and zōon/ζῷον meaning "animal" or "living being". It is one of three geologic eras of the Phanerozoic Eon, preceded by the Paleozoic ("ancient life") and succeeded by the Cenozoic ("new life"). The era is subdivided into three major periods: the Triassic, Jurassic, and Cretaceous, which are further subdivided into a number of epochs and stages. The era began in the wake of the Permian–Triassic extinction event, the largest well-documented mass extinction in Earth's history, and ended with the Cretaceous–Paleogene extinction event, another mass extinction which is known for having killed off non-avian dinosaurs, as well as other plant and animal species. The Mesozoic was a time of significant tectonic, climate and evolutionary activity. The era witnessed the gradual rifting of the supercontinent Pangaea into separate landmasses that would eventually move into their current positions. The climate of the Mesozoic was varied, alternating between warming and cooling periods. Overall, however, the Earth was hotter than it is today. Non-avian dinosaurs appeared in the Late Triassic and became the dominant terrestrial vertebrates early in the Jurassic, occupying this position for about 135 million years until their demise at the end of the Cretaceous. Birds first appeared in the Jurassic, having evolved from a branch of theropod dinosaurs. The first mammals also appeared during the Mesozoic, but would remain small—less than 15 kg (33 lb)—until the Cenozoic. The lower (Triassic) boundary is set by the Permian–Triassic extinction event, during which approximately 90% to 96% of marine species and 70% of terrestrial vertebrates became extinct. It is also known as the "Great Dying" because it is considered the largest mass extinction in the Earth's history. The upper (Cretaceous) boundary is set at the Cretaceous–Paleogene extinction event (or K–Pg) extinction event), which may have been caused by the impactor that created Chicxulub Crater on the Yucatán Peninsula. Towards the Late Cretaceous large volcanic eruptions are also believed to have contributed to the Cretaceous–Paleogene extinction event. Approximately 50% of all genera became extinct, including all of the non-avian dinosaurs. The Triassic ranges roughly from 252 million to 201 million years ago. The Triassic is a time in Earth's history bracketed between the Permian Extinction and the Triassic–Jurassic extinction event, two of the big five, and precedes the Jurassic Period. It has three major epochs: the Early Triassic, the Middle Triassic and the Late Triassic. The Early Triassic was between about 252 million to 247 million years ago and was dominated by deserts as Pangaea had not yet broken up, thus the interior was nothing but arid. The Earth had just witnessed a massive die-off in which 95% of all life became extinct. The most common vertebrate life on earth were Lystrosaurus, labyrinthodonts, and Euparkeria along with many other creatures that managed to survive the Great Dying. Temnospondyls evolved during this time and would be the dominant predator for much of the Triassic. The Middle Triassic spans roughly from 247 million to 237 million years ago. The Middle Triassic featured the beginnings of the breakup of Pangaea, and the opening of the Tethys Sea. The ecosystem had recovered from the devastation that was the Great Dying. Algae, sponge, corals, and crustaceans all had recovered, and the reptiles began to get bigger and bigger. New aquatic reptiles evolved such as ichthyosaurs and nothosaurs. Meanwhile, on land, Pine forests flourished, bringing along mosquitoes and fruit flies. The first ancient crocodilians evolved, which sparked competition with the large amphibians that had since ruled the freshwater world. The Late Triassic spans roughly from 237 million to 201 million years ago. Following the bloom of the Middle Triassic, the Late Triassic featured frequent heat spells, as well as moderate precipitation (10-20 inches per year). The recent warming led to a boom of reptilian evolution on land as the first true dinosaurs evolve, as well as pterosaurs. During the Late Triassic, some advanced cynodont gave rise to the first Mammaliaformes. All this climatic change, however, resulted in a large die-out known as the Triassic-Jurassic extinction event, in which many archosaurs (excluding pterosaurs, dinosaurs and crocodylomorphs), most synapsids, and almost all large amphibians became extinct, as well as 34% of marine life in the fourth mass extinction event of the world. The cause is debatable. The Jurassic ranges from 200 million years to 145 million years ago and features 3 major epochs: The Early Jurassic, the Middle Jurassic, and the Late Jurassic. The Early Jurassic spans from 200 million years to 175 million years ago. The climate was much more humid than the Triassic, and as a result, the world was very tropical. In the oceans, plesiosaurs, ichthyosaurs and ammonites were abundant. On land, dinosaurs and other reptiles stake their claim as the dominant race of the land, with species such as Dilophosaurus at the top. The first true crocodiles evolved, pushing out the large amphibians to near extinction. All-in-all, reptiles rise to rule the world. Meanwhile, the first true mammals evolve, remaining relatively small sized but otherwise expanding ecologically; the Jurassic Castorocauda, for example, had adaptations for swimming, digging and catching fish. Fruitafossor, from the late Jurassic period about 150 million years ago, was about the size of a chipmunk and its teeth, forelimbs and back suggest that it broke open the nest of social insects to prey on them (probably termites, as ants had not yet appeared). The first multituberculates like Rugosodon evolve, while volaticotherians take to the skies. The Middle Jurassic spans from 175 million to 163 million years ago. During this epoch, reptiles flourished as huge herds of sauropods, such as Brachiosaurus and Diplodocus, filled the fern prairies of the Middle Jurassic. Many other predators rose as well, such as Allosaurus. 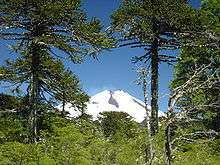 Conifer forests made up a large portion of the forests. In the oceans, plesiosaurs were quite common, and ichthyosaurs were flourishing. This epoch was the peak of the reptiles. The Late Jurassic spans from 163 million to 145 million years ago. During the Late Jurassic, the first avialans, like Archaeopteryx, evolved from small coelurosaurian dinosaurs. The increase in sea-levels opened up the Atlantic sea way which would continue to get larger over time. The divided world would give opportunity for the diversification of new dinosaurs. The Cretaceous is the longest period in the Mesozoic, but has only two epochs: the Early Cretaceous, and the Late Cretaceous. The Early Cretaceous spans from 145 million to 100 million years ago. The Early Cretaceous saw the expansion of seaways, and as a result, the decline and extinction of sauropods (except in South America). Some island-hopping dinosaurs, like Eustreptospondylus, evolved to cope with the coastal shallows and small islands of ancient Europe. Other dinosaurs rose up to fill the empty space that the Jurassic-Cretaceous extinction left behind, such as Carcharodontosaurus and Spinosaurus. Of the most successful would be the Iguanodon which spread to every continent. 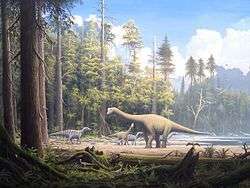 Seasons came back into effect and the poles got seasonally colder, but dinosaurs still inhabited this area like the Leaellynasaura and Muttaburrasaurus which inhabited the polar forests year-round. Since it was too cold for crocodiles, it was the last stronghold for large amphibians, like Koolasuchus. Pterosaurs got larger as species like Tapejara and Ornithocheirus evolved. Mammals continued to expand ecologically; eutriconodonts produced fairly large, wolverine-like predators like Repenomamus and Gobiconodon, early therians began to expand into metatherians and eutherians, and cimolodont multituberculates went on to become large components of the fossil record. The Late Cretaceous spans from 100 million to 65 million years ago. The Late Cretaceous featured a cooling trend that would continue on in the Cenozoic period. Eventually, tropics were restricted to the equator and areas beyond the tropic lines featured extreme seasonal changes in weather. 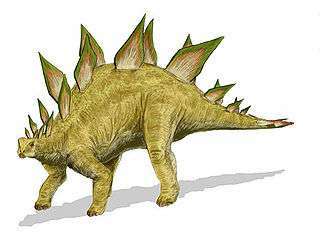 Dinosaurs still thrived as new species such as Tyrannosaurus, Ankylosaurus, Triceratops and hadrosaurs dominated the food web. In the oceans, mosasaurs ruled the seas to fill the role of the Ichthyosaurs - which disappeared for poorly understood reasons -, and huge plesiosaurs, such as Elasmosaurus, evolved. Flowering plant, possibly appearing as far back as the Triassic, became truly dominant for the first time. Pterosaurs in Late Cretaceous declined for poorly understood reasons, though this might be due to fossil record bias as their diversity seems to be much higher than previously thought. Birds became increasingly common and diverse, diversifying in a variety of enantiornithe and ornithurine forms. Though mostly small, marine Hesperornithes became relatively large and flightless, adapted to life in the open sea. Metatherians and primitive eutherian also became common and even produced large and specialised species like Didelphodon and Schowalteria. Still, the dominant mammals were multituberculates, cimolodonts in the north and gondwanatheres in the south. At the end of the Cretaceous, the Deccan traps and other volcanic eruptions were poisoning the atmosphere. As this was continuing, it is thought that a large meteor smashed into earth, creating the Chicxulub Crater in an event known as the K-T Extinction, the fifth and most recent mass extinction event, in which 75% of life on earth became extinct, including all non-avian dinosaurs. Everything over 10 kilograms became extinct. The age of the dinosaurs was over. Compared to the vigorous convergent plate mountain-building of the late Paleozoic, Mesozoic tectonic deformation was comparatively mild. The sole major Mesozoic orogeny occurred in what is now the Arctic, creating the Innuitian orogeny, the Brooks Range, the Verkhoyansk and Cherskiy Ranges in Siberia, and the Khingan Mountains in Manchuria. This orogeny was related to the opening of the Arctic Ocean and subduction of the North China and Siberian cratons under the Pacific Ocean. Nevertheless, the era featured the dramatic rifting of the supercontinent Pangaea. Pangaea gradually split into a northern continent, Laurasia, and a southern continent, Gondwana. This created the passive continental margin that characterizes most of the Atlantic coastline (such as along the U.S. East Coast) today. By the end of the era, the continents had rifted into nearly their present form. Laurasia became North America and Eurasia, while Gondwana split into South America, Africa, Australia, Antarctica and the Indian subcontinent, which collided with the Asian plate during the Cenozoic, the impact giving rise to the Himalayas. The Triassic was generally dry, a trend that began in the late Carboniferous, and highly seasonal, especially in the interior of Pangaea. Low sea levels may have also exacerbated temperature extremes. With its high specific heat capacity, water acts as a temperature-stabilizing heat reservoir, and land areas near large bodies of water—especially the oceans—experience less variation in temperature. Because much of the land that constituted Pangaea was distant from the oceans, temperatures fluctuated greatly, and the interior of Pangaea probably included expansive areas of desert. Abundant red beds and evaporites such as halite support these conclusions, but evidence exists that the generally dry climate of the Triassic was punctuated by episodes of increased rainfall. Most important humid episodes were the Carnian Pluvial Event and one in the Rhaetian, few million years before the Triassic–Jurassic extinction event. The climate of the Cretaceous is less certain and more widely disputed. Higher levels of carbon dioxide in the atmosphere are thought to have caused the world temperature gradient from north to south to become almost flat: temperatures were about the same across the planet. Average temperatures were also higher than today by about 10°C. In fact, by the middle Cretaceous, equatorial ocean waters (perhaps as warm as 20 °C in the deep ocean) may have been too warm for sea life, and land areas near the equator may have been deserts despite their proximity to water. The circulation of oxygen to the deep ocean may also have been disrupted. For this reason, large volumes of organic matter that was unable to decompose accumulated, eventually being deposited as "black shale". Some plant species had distributions that were markedly different from succeeding periods; for example, the Schizeales, a fern order, were skewed to the Northern Hemisphere in the Mesozoic, but are now better represented in the Southern Hemisphere. Recent research indicates that the specialized animals that formed complex ecosystems, with high biodiversity, complex food webs and a variety of niches, took much longer to reestablish, recovery did not begin until the start of the mid-Triassic, 4M to 6M years after the extinction and was not complete until 30M years after the Permian–Triassic extinction event. Animal life was then dominated by various archosaurian reptiles: dinosaurs, pterosaurs, and aquatic reptiles such as ichthyosaurs, plesiosaurs, and mosasaurs. The climatic changes of the late Jurassic and Cretaceous provided for further adaptive radiation. The Jurassic was the height of archosaur diversity, and the first birds and eutherian mammals also appeared. Angiosperms radiated sometime in the early Cretaceous, first in the tropics, but the even temperature gradient allowed them to spread toward the poles throughout the period. By the end of the Cretaceous, angiosperms dominated tree floras in many areas, although some evidence suggests that biomass was still dominated by cycad and ferns until after the Cretaceous–Paleogene extinction. ↑ Alan Kazlev. "Early Triassic". unknown. 1 2 3 Carl Fred Koch. "Cretaceous". Old Dominion University. ↑ Preto, N.; Kustatscher, E.; Wignall, P.B. (2010). 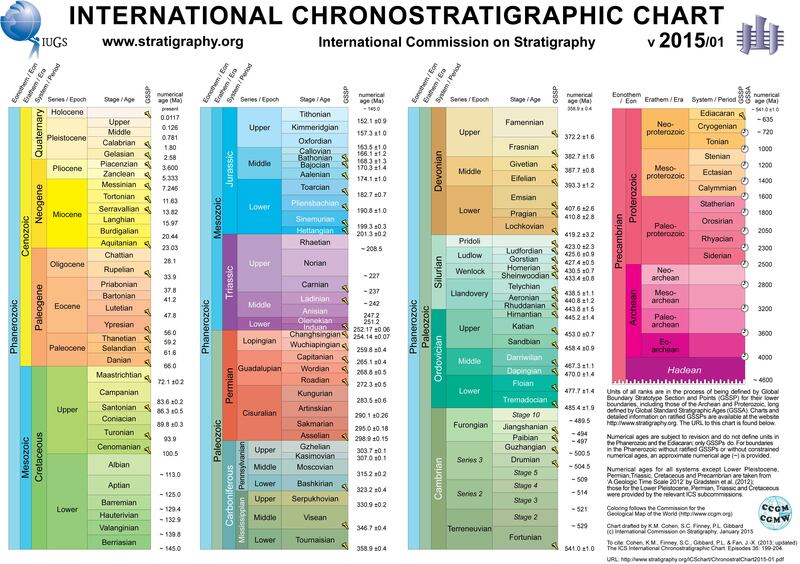 "Triassic climates — State of the art and perspectives". Palaeogeography, Palaeoclimatology, Palaeoecology. 290: 1–10. doi:10.1016/j.palaeo.2010.03.015. ↑ Sahney, S. & Benton, M.J. (2008). "Recovery from the most profound mass extinction of all time" (PDF). Proceedings of the Royal Society: Biological. 275 (1636): 759–65. doi:10.1098/rspb.2007.1370. PMC 2596898 . PMID 18198148.